This Tibetan Buddhist monastery was built in the 16th century around the same time as the other 2 monasteries established by the 9th Karmapa Wangchuk Dorje and was the main seat of the Karma Kagyu lineage for some time and was eventually abandoned to ruins. When the 16th Karmapa arrived in Sikkim in 1959, he decided to rebuild the monastery as the site was considered highly auspicious. The monastery contains the sacred items and relics brought out of Tsurphu monastery in Tibet where the 16th Karmapa fled from. 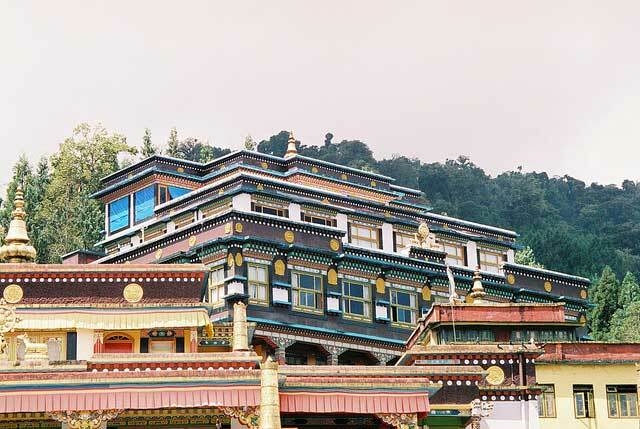 The monastery lies in the heart of nature with breathtaking views of the surroundings like flowing streams, mountains behind, a snow range in front, and a river below and is the largest monastery in Sikkim. It is home to the community of monks and where they perform the rituals and practices of the Karma Kagyu lineage. A Golden Stupa contains the relics of the 16th Karmapa. Opposite that building is a college, Karma Shri Nalanda Institute for Higher Buddhist Studies. Rumtek is located 24 km from Gangtok, the capital of the Sikkim, at an altitude of about 1500 meters above sea level. There are quite a number of small hotels in the village which the tourists can utilize for their stay and enjoy the stay near the monastery and its picturesque surroundings. There are impressive masked Chaam dances during the annual Buddhist festival called as Drupchen. During this time you can also see Tibetan opera performances along with many other cultural displays which will help you to understand the Buddhist culture in a much better way. The monastery complex is the prime reason that tourists come to Rumtek village.